In four innovative essays, Linda Russo celebrates five female authors whose lives span the interval from the Romantic period to the present day. In the first essay, on Dorothy Wordsworth, Russo traces a causal connection between the author’s daily walks and her ability to think in ways that proved useful to her famous brother. She also introduces the feminist practice of “talk[ing] back to literary history,” catalyzed here by evidence of Dorothy’s erasure from William’s compositional process. Russo’s secondhand copy of Dorothy’s Journals came, she tells us, from the library of a women’s college, and its trenchant marginalia “tracks Dorothy’s words in William’s poems and traces William’s treads through Dorothy’s journals.” The high quality of that sentence, which uses parallel structure to set Dorothy’s lightfoot “words” against William’s implicitly stick-cracking “treads,” is representative of the book overall. A lengthy second essay on Dickinson shows how “E.D.” is rendered present and active by Russo’s tenacious imagination and the books she packs along on delighted but undeceived visits to Dickinson’s desk (at Harvard University) and to the Dickinson homestead in Amherst. The essay begins in Dickinson’s room itself, where Russo gazes through its windows: “Today the sky is a luminous slate,” she writes, showing us a bright blank that she herself must trace meaning on, and does. With Hettie Jones, the third essay shifts into the twentieth century. Jones’s 1990 memoir, How I Became Hettie Jones, details her work as unofficial amanuensis to her then-husband LeRoi Jones, later known as Amiri Baraka. In response, Russo writes a crackling experimental dialogue laying bare the absurd systems of thought that designated LeRoi Jones a poet and his wife “an important component in the production of poetry.” It’s a virtuoso performance, both angry and artful. 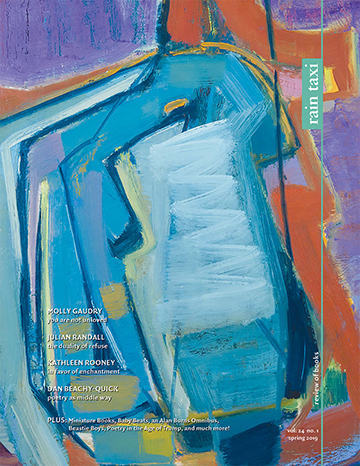 The fourth essay, on contemporary poets Joanne Kyger and Anne Waldman, begins at Kyger’s tea-table, among conversation. Here we come into the present, where Waldman’s recently completed feminist epic, The Iovis Trilogy, can be discussed between friends. 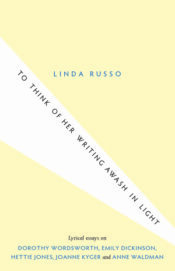 If these friends are also influencers, whose voices sometimes over-write the author’s own, it is by now a small matter; if we want to dissent, Linda Russo has shown us how we can thoughtfully talk back, even to a history of her own choosing. This entry was posted in Uncategorized and tagged Fall 2016 on December 2, 2016 by Kelly.